The 1954 Protection of Birds Act includes a clause that permits the men of Ness to hunt guga (young gannet) and so, the fowlers of Ness on the Isle of Lewis, voyage annually to the remote Isle of Sula Sgeir to hunt the guga. Adult gannets are stunning. They have a distinctive plumage and piecing blue eyes. The young gannet in comparison is but a fluffy ball and its flesh is in great demand. Some however, consider the taste which is described as neither fish nor fowl, vile. The fishy flavour is found in the fat that surrounds the rich, dark sea bird meat. There is an excellent description of the guga hunt in Donald S Murray's book, The-Guga-Hunters. I was fortunate to hear Donald speak on the subject at this year's Winter-Words Festival. I left the festival determined to reconnect with a nurse from Ness, who may or may not help me to get my hands on a guga in August - the month when the guga is hunted. Guga hunting is a tradition and one that Donald S Murray argues now has a secondary task that involves the removal of plastic waste. A few years ago, I didn't know what a nurdle (a tiny pellet of plastic) was, and yet now, nurdles threaten sea life. Donald Murray's talk was chaired by Hugh Andrew of Birlinn Books who raised the question of the contemporary Island diet - the subject of this blog. 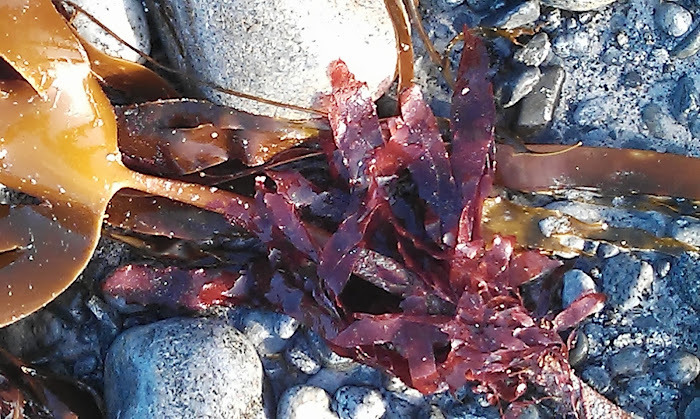 I live on an Outer Hebridean Isle and I often cook with foraged ingredients. My husband is the local doctor but Hebridean holidays aside, I knew little about traditional Hebridean recipes until we made the move West. The wind blows in the Outer Hebrides and so meaningful, allotment style gardening is a task for the tenacious. For my part, I depend on a supermarket with four aisles, one of which is well stocked with alcohol. Over the Causeway there is MacLennans a very decent store which sells local venison and shellfish. The people who dwell on that Isle are indeed fortunate omnivores. Fishing and crofting are of course a way of Island life, and those in touch with the sea and land have the potential to supplement their supermarket basket. Island life does not come without its difficulties. Weather aside, childcare can involve long and expensive nursery miles. Time is an Isle as well as a mainland issue. In an age of convenience, it is unclear if many of the younger generation find the time to cook traditional Island fare. The ferryman delivers, supper choice is limited and comes with readymade ferry miles. This is not news, a couple of generations ago, the folk of St Kilda became dependent on visiting tourists for a wage. Islanders make an easy case study but be aware that Island shopping baskets will vary geographically. I'll dare to suggest however, that as a nation, we have left many of our food traditions at the door of the eager to please supermarket. Cities may thrive and brag a cosmopolitan food basket but even a city dweller can top up a salad bowl with foraged wild edibles. The supermarket may waylay traditional cooking, but at the higher end of the market there is an eagerness to embrace traditional foods. There is a new pop up restaurant with a menu that sweeps the Highlands and Isles, scooping up delicious morsels and displaying them on a banquet table. In Edinburgh, The Food Studio offers a restaurant and a cornucopia of interesting artisan food projects. Meanwhile, on my Isle where the grass isn't very green but the sea can be a myriad of blues and turquoises, there are shelves of pot noodles and other mainland factory products. In my tiny supermarket I can find Island baking (I of course, bake my own) but the shelf odds are stacked against traditional Island food. In bygone days, the St Kildan 'birdmen', developed claw-like fingers and toes, to scamper up and down the highest cliffs in Britain, in their quest for eggs and sea birds - this is now frowned upon, but surely their traditional diet was more nutritious than some of the packets on offer in my Island supermarket. This recipe, taken from from Seaweed in the Kitchen, uses the seaweed carrageen as a setting agent. 25g carrageen gives a firm set. Creamy crabmeat set with a seaweed from the lower seashore. Heat the milk and carrageen for about 15 minutes until it is thick and gelatinous. Strain the milk through a nylon sieve to leave around 100ml of thick liquid. Put the double cream in a pan with the carrageen milk and heat to just below boiling point. Add the lime zest, sea lettuce (to taste) and crab, stir briefly and pour into moulds. Leave to cool and refrigerate until use. To serve: briefly dip the mould in hot water, loosen the set crab with a knife and turn onto a serving plate.